All orders will be placed on the 12th April 2019 and will be delivered by 19th April. Free delivery in the Kapiti Region Paekakariki to Otaki. If you have any problems with shipping charges contact us here. 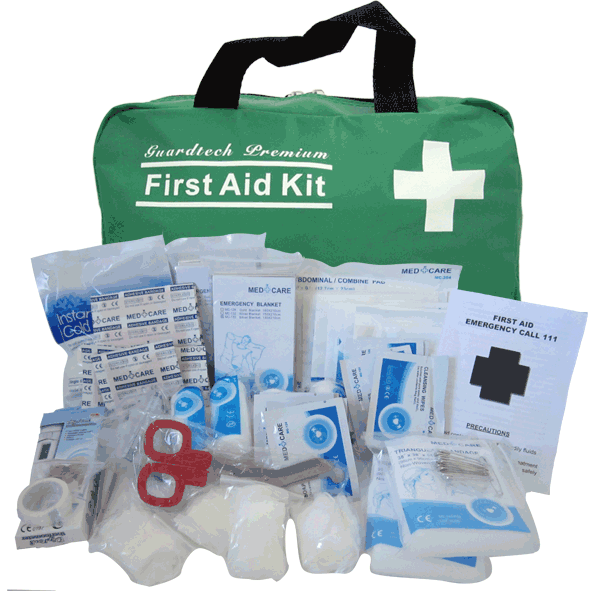 Our large premium first aid kit contains all the items recommended for Workplace First Aid Kits in the “First Aid for Workplaces – A Good Practice Guide” published by Worksafe NZ. We have also added extra items such as an instant ice pack & Digital Thermometer. We are sure that you will be satisfied with your purchase and we offer a MONEYBACK GUARANTEE. CE approved. Follows Worksafe NZ Guidelines. Heavy Duty Waterproof Bag with internal pockets. The 4 separate transparent compartments fold out so you can easily see all the contents at a glance. Measures 240mm x 180mm x 85mm. There is still plenty of space available to add extra contents such as saline solution and medication if required. This handy bag contains everything you need for the home or workplace.